Despite calls by a minority to reduce dairy intake, cheese is considered a staple food in the UK, with almost 90% of consumers eating cheese every month and two-thirds eating cheese at least twice a week (Mintel). Furthermore, almost 99% of the population bought cheese at least once in the 52 weeks to July 2018 (Kantar Worldpanel, 52 w/e 15 Jul 2018), with value sales up 3.7% during this period, making it a strong year for cheese. In line with this, value sales of Cheddar have increased by 3.9%, despite a 0.5% reduction in volumes sold (Kantar Worldpanel, 52 w/e 15 Jul 2018). While Cheddar continues to be the Nation’s most popular cheese, accounting for around half of UK cheese sales, purchase of this great British favourite has failed to keep pace with the overall market over the past year (Kantar Worldpanel, 52 w/e 15 Jul 2018). 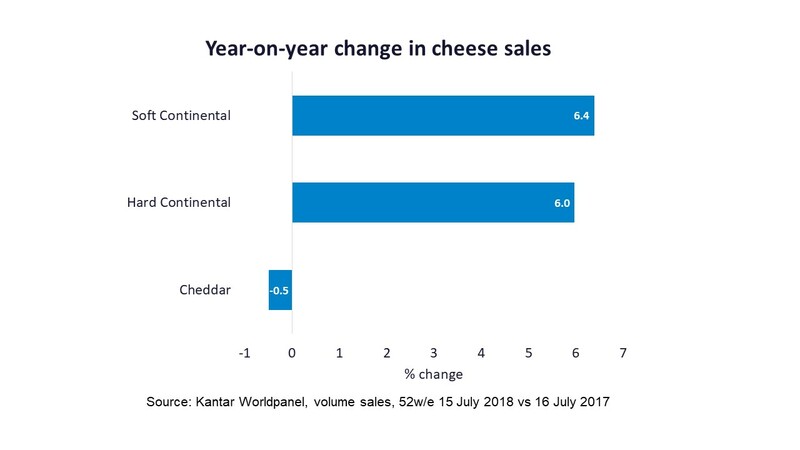 In contrast to the decline in volume of Cheddar sales, however, continental cheeses enjoyed volume and value growth, with sales volumes of hard continental cheeses up by 6% and soft continental cheese up by 6.4% in the year to July 2018 (Kantar Worldpanel, 52 w/e 15 Jul 2018). Great Britain is well known for its Cheddar production, but as the Great British cheese board has evolved to a more continental scene, so too has UK cheese production. There are now over 700 different types of cheese made in Britain (The Cheese Board); more than France and Switzerland combined. With this movement, there is continued interest in regional British cheeses; the second most commonly purchased cheese type between May and July 2018 (Mintel). Cheddar remains the ‘big cheese’ by far, with 86% of households purchasing it in the three months to October 2018 (Kantar Worldpanel, 12 w/e 7 Oct 2018). However, Cheddar’s popularity as a versatile ingredient, well suited to many cooked dishes, could also be its downfall. Research conducted by Mintel in 2015 showed that just 13% of consumers considered Cheddar to make the cut when it came to special occasions. On the other hand, over a third of consumers considered soft continental cheeses, such as Brie or Camembert, fitting for such occasions. In addition, the more recent increased availability of continental cheeses, higher prices of British cheeses, promotion of continental cheeses in cooking, and the rise of the ‘foodie’ are all likely to be playing a role in the increased purchase of these more exotic varieties. In summary, while our own beloved British Cheddar looks set to stay, the hunger for more exotic flavours could provide further opportunities for the production of more continental-style cheeses, and a boost for the territorials.